This Halloween I wanted to make something special for our friends. We had a few scary movies planned but I wanted to make an autumn treat. 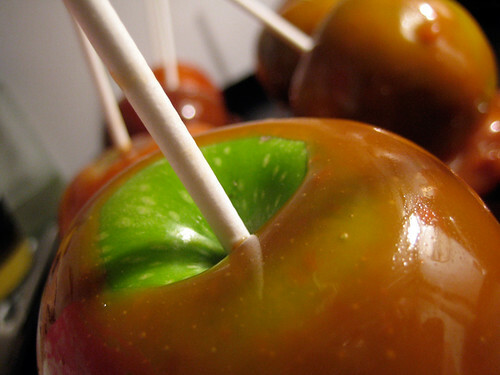 When I saw 101 Cookbook‘s recipe for caramel apples, I was instantly won over. The ingredients were simple: honey, cream, salt, apples. The previous weekend, I picked up several kinds of apples at a local orchard and I had some local blueberry honey from a previous farm visit. Local heavy cream was easy to find and I figured adding in some imported french fleur de sel wouldn’t ruin my almost all-local sweets. I also decided to toast and roughly chop some almonds which not only would provide a nice crunch and counter balance the sweetness, but would also provide some traction to prevent the caramel from sticking to my baking sheet. The resulting apples were beautiful and delicious. I should note, that if you don’t like honey, don’t make these as as the honey flavour is definitely there, even with a mild-tasting honey. For the apples, I used Granny Smith’s and Cox Orange Pippins which are both very crisp apples with a nice bit of tartness. I purchased the lollipop sticks at a local kitchen shop in Chinatown and got to work on the caramel. It was easy going and while I do have a candy thermometer, I really rely more on the old fashioned cold water test for figuring out which stage my caramel has reached. I can never get my candy thermometer to reach the “hard ball” stage but using my fingers to gauge a bit of caramel dropped in ice water never fails. For me it took about 30-35 minutes to reach caramel perfection. I was afraid that the caramel would slide off the apples, but luckily that didn’t happen! After dipping the apples in the caramel, I had extra caramel leftover, so I spread some out on my silpat mat, adding in some roasted almonds and some fleur de sel and let cool in the refrigerator. Once it was cool and ready to cut, I sliced the caramel into squares and wrapped the golden nuggets in waxed paper. Pierce apples with a stick and set aside. In a large heavy-bottomed pot, heat the cream and salt until small bubbles appear. Whisk in the honey and bring to a boil, stirring constantly with a wooden spoon. You want to bring the mixture to a constant steady boil, so turn down the heat to medium or medium-high. If you are using a candy thermometer, you should reach 250-255F or do the cold water test. It should take 20 – 35 minutes to reach this stage. Look for a rich, golden caramel colour and the mixture should look heavy. The caramel reached as high as 250F and I let it boil away at that temperature for 5 minutes or so, testing always in cold water to make sure I had the correct consistency. Take caramel off the stove and carefully dip each apple in the caramel mixture, setting the finished apples on lightly oiled waxed paper or a silpat mat covered in chopped almonds. 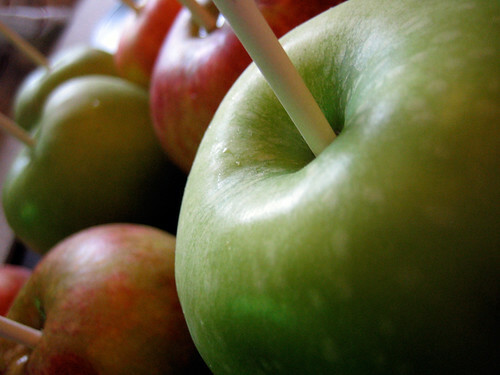 Place in fridge to set and then wrap each apple in waxed paper. If you have any leftover caramel, pour the remaining caramel onto a well oiled sheet or silpat mat and sprinkle with almonds and fleur de sel. Refrigerate until cool and cut into squares, wrapping each square in waxed paper. That looks absolutely delicious! And its a great way to use those Fall apples! I think that is a great way to use up caramel. I would have just stuck my fingers in and indulged. But caramels make such a nice gift and they are so addictive. mmmm! this caramel looks great!! i have been wanting to make salted caramel squares! yum!! Cool, I just made caramel apples this week too! I read that recipe at 101 cookbooks, too, but since we were making ours for a bake sale, we decided to go with a Martha Stewart recipe instead. Now I have to try out the one you used! Those apples look great, and so do your caramels. might be too soon for me to ask for your hand in marriage, right? chocolate shavings, normally i like healthy with my apples, so it’s nice to be a bit decadent now and then! haha, manger! luckily, i don’t have that much of a sweet tooth, so handing out the caramels as gifts is the generous thing to do. heather, if you search my archives, i’ve got another salted caramel recipe too! those caramel squares are very cute! always creative with the leftovers. So smart to use the extras to make caramel candies! The honey ones are my favorite – I might have to do the same for the holidays this year! Great idea. thanks jessie, i'll definitely make more caramels like these for giving during the holidays. so easy and good! I’d love one of those sweet nuggets! I am an absolute devotee to all things caramel, and I love the idea of honey caramel. And oh, those apples! They look awesome. Wow, these are making my mouth water. I’ve never made candy before. I wouldn’t even know where to start. How do you even use a candy thermometer? That being said I like the sound of the salted caramel as a dipping sauce for fruit. Did this solidify or remain sticky and gooey? Maybe one day I’ll roll up my sleeves and try this recipe but for now I’ll just drool. Superb party treat! I’d take one of these over a whole bag of nasty Halloween candy. yum. I keep wanting to do up some caramel with salt. One of these days. Aren’t these amazing? I used the caramel recipe from 101 cookbooks as well, a couple weeks ago. well, start making them, notsocrafty! they’re well worth it. bijoux, the candy thermometer just clips onto the pot. it’s easy! the caramel doesn’t remain sticky…but i’m sure if you didn’t cook it so long, it would be syrupy. it’s all about the ice water test! aimee, this beats generic halloween candy hands down! I’ve been eyeing the caramel recipes at 101 Cookbooks for a long time! And now caramel apples! My favorite! Hope I get a chance to make some this year! that´s so beautiful! I´ve never had caramel apples, but they pop up a lot in disney cartoons, so it´s been a longtime fond wish. maybe I´ll try them, thanks! I just tried your recipe and it is great! however, when I put the extra caramel onto the wax paper to let it harden, the wax paper wouldn’t pull off. is there anything you would recommend? nicole, these are so worth it! yum. haha, lobstersquad! it’s my first time eating a caramel apple and they are good. seriously good. teddy, i put the extra caramel onto a silpat mat, which prevents sticking. 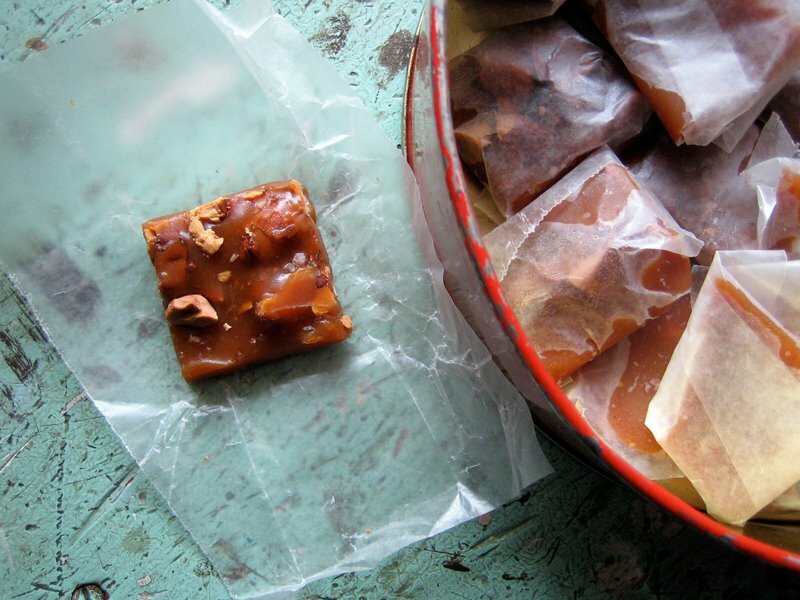 next time oil or butter up the wax paper before you pour the caramel over it! Are you sure the temperature is correct: 350to 390 F? Seems about a hundred degrees higher than in should be. The recipe looks delicious. I never cooked honey caramel apples, always thought it is difficult. I will try. Thx for sharing!